Febr uary was a month of firsts as the SAM Foundation welcomed new music educator Victoria DeVito and new program partner Fantastic Friends of WNY. 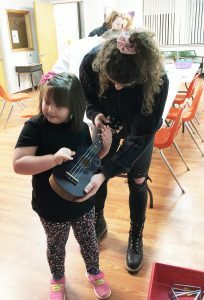 As a fresh graduate of SUNY Fredonia’s music education program, Victoria has effortlessly transitioned into leading our program with Fantastic Friends, a human services agency focusing on both children and adults with special needs. 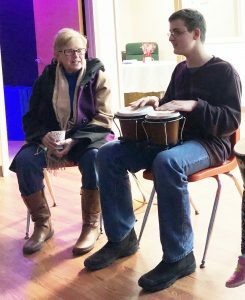 SAMF sponsored four programs at Fantastic Friends during the month of February, and following an enthusiastic response, will continue to facilitate a monthly program through August of 2019. Participants were guided through the making of musical instruments like shakers and drums that allowed them to join in the performance portion of the program. Victoria is a multi-instrumentalist and is able to incorporate her playing of the clarinet, saxophone, flute, guitar, and ukulele, as both the students and their families participate in sing-a-longs. After singing to Americana classics like “I’ve Been Working on the Railroad” and “Skip to My Lou,” Victoria finishes class with a request by the participants and an all included dance party. New participants are joining the program each week as Victoria expands the program to include new music and activities that engages this inspiring audience.